It is a blush and copper Christmas this year at my house! And to say I adore pink is an understatement. 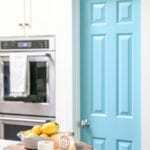 I have carried on a love affair with the girly shade for over 20 years. Lately I have been drawn to it’s somewhat softer cousin, blush! 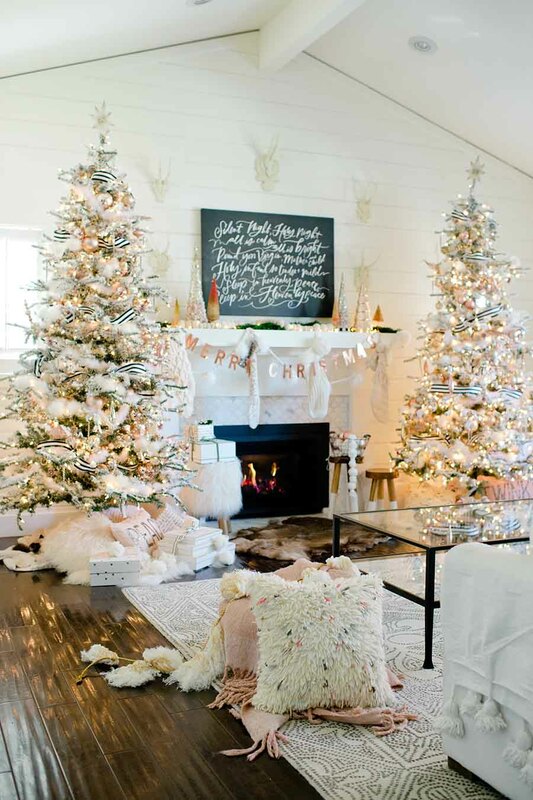 So, this Christmas, I naturally felt it was time to really focus on creating a tree filled with blush and copper Christmas decorations. 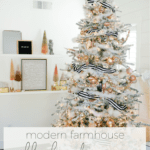 If you want to see more of my holiday home this year be sure to check out my Modern Farmhouse Holiday Home Tour! 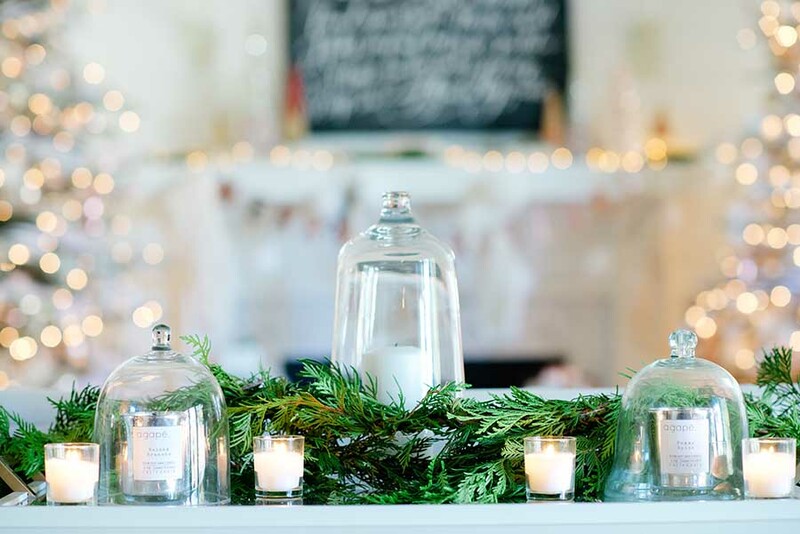 I feature my front porch and Christmas kitchen, which you don’t want to miss! 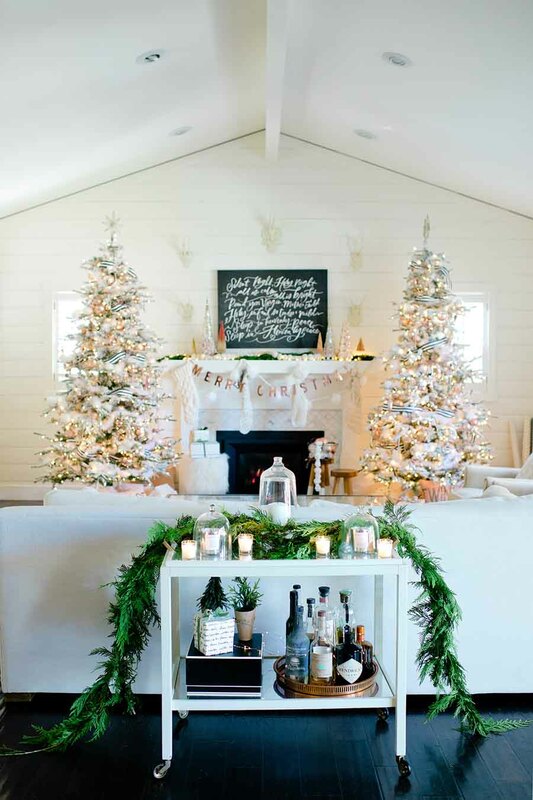 Ever since Leslie of The Leslie Style posted photos a few years ago of her Christmas decor featuring two Christmas trees I have been smitten. Actually, beyond smitten. I knew I wanted to create the same kind of magic. This year is it. 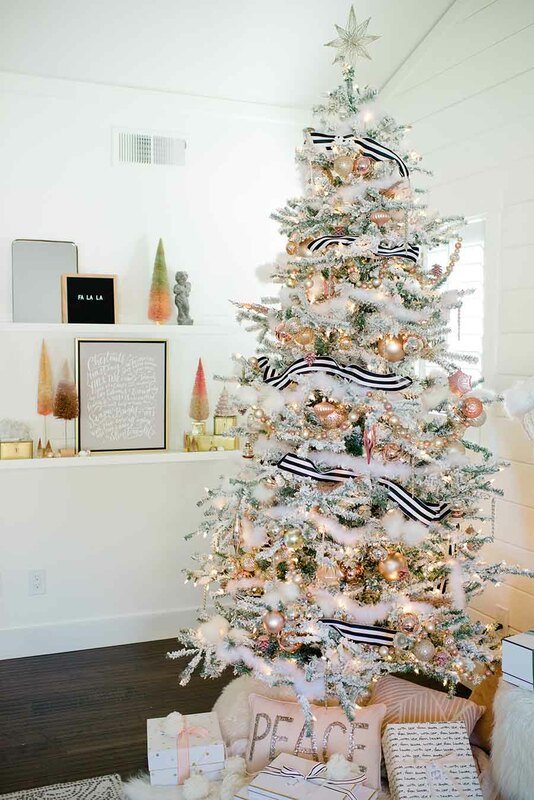 I found a duplicate of my favorite flocked tree and purchased it in August with this vision in mind! Then when I was digging through my Christmas decorations, I found an old “Merry Christmas” banner I had purchased from Target years ago. 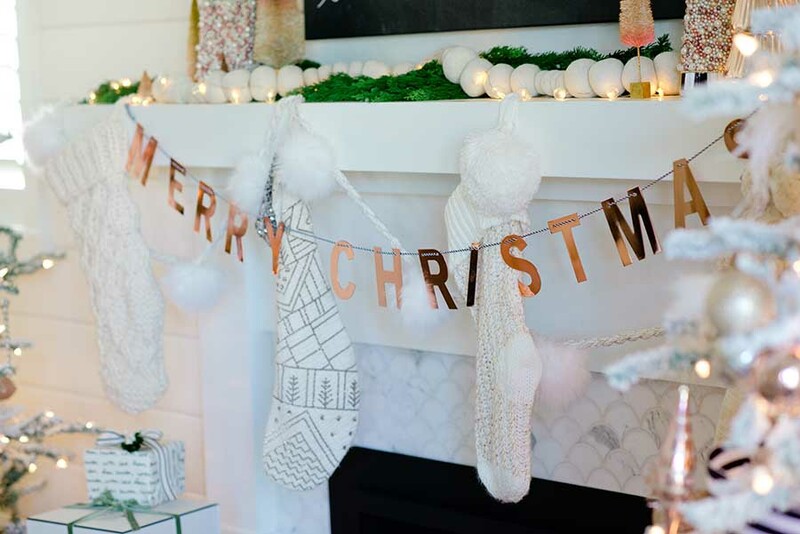 The letters are a shiny copper and they are tied together with black and white bakers twine. The combination is both perfectly modern and eclectic at the same time. 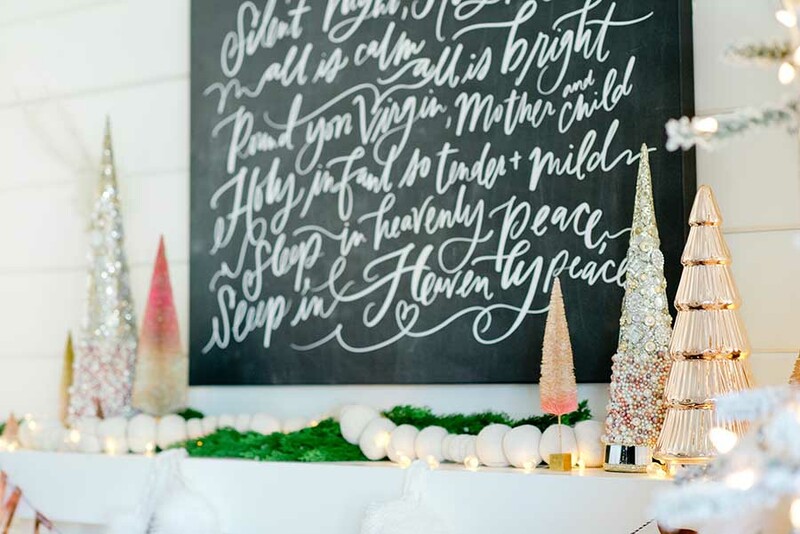 It’s what inspired me to create this blush and copper Christmas theme. 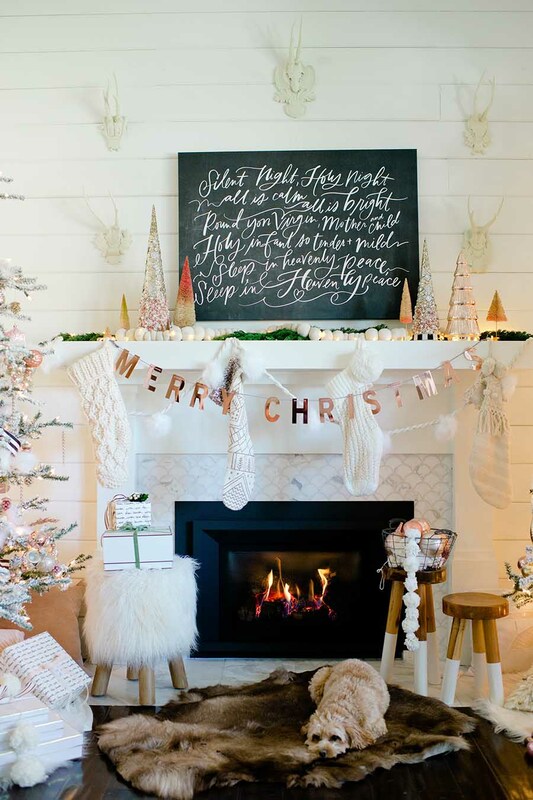 Be sure you check out this post featuring my Rose Gold Christmas Mantel. I love how the copper color mimics the color of a warm winter fire. 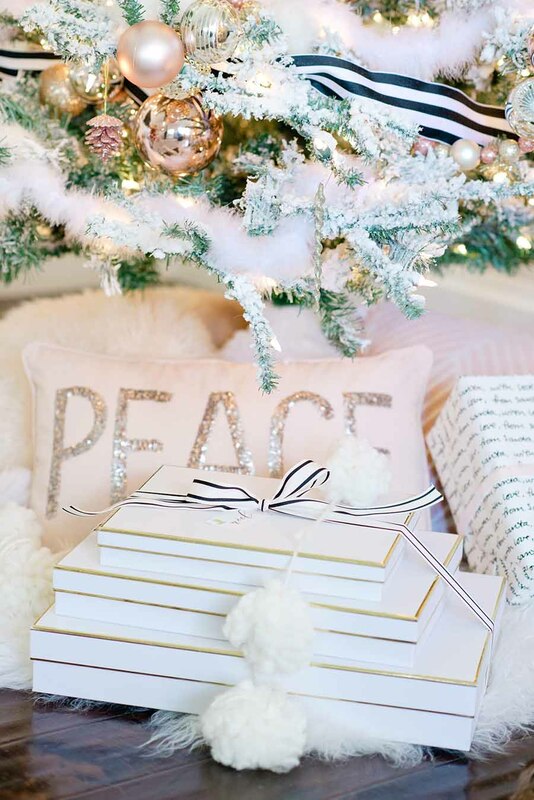 And a tree filled with this blush hue creates quite the cozy ambiance in my living room! I found most of my copper ornaments at Michael’s. I used varying shades of copper, blush and silver. 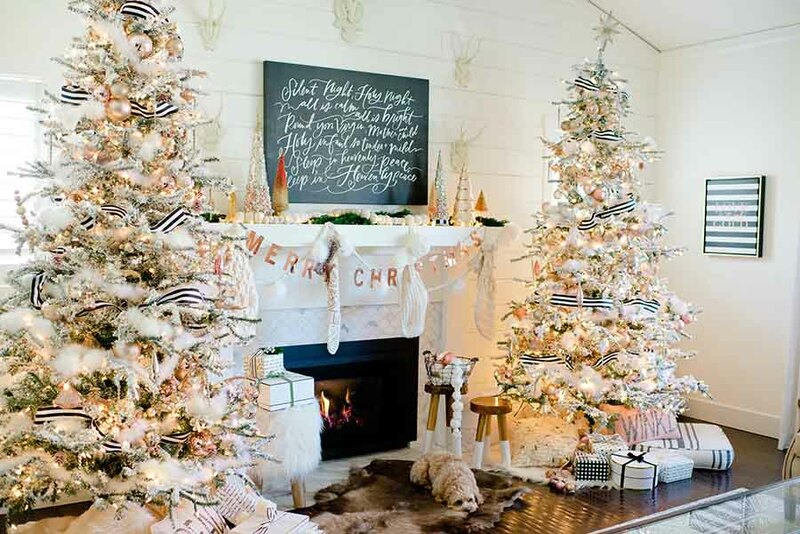 And draping the tree limbs with a white feather boa added to the snowy look. The feathers look like tufts of freshly fallen snow! 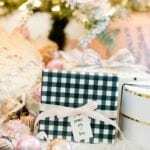 This black and white awning stripe ribbon is the perfect accent to my blush and copper Christmas decorations. I love how it adds an unexpected pop of drama and contrast! And it ties in perfectly with my Lindsay Letters Silent Night canvas. 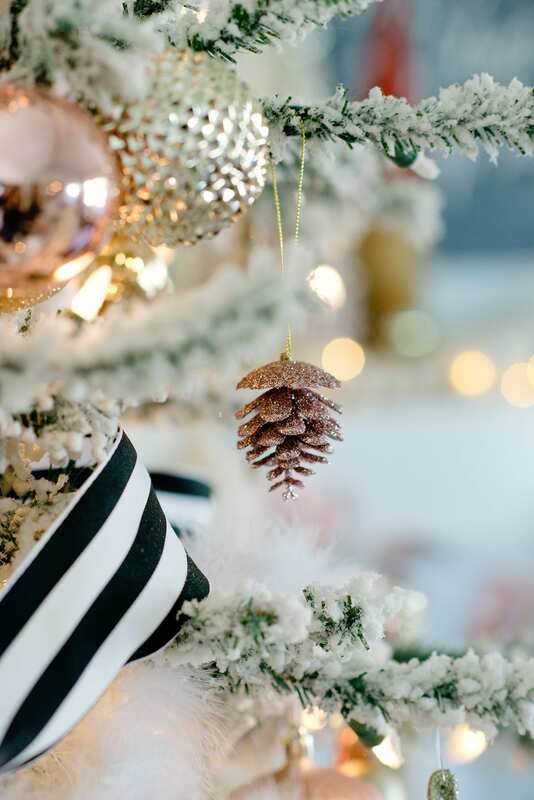 The key to decorating your Christmas tree when sticking with a color scheme is to buy your ornaments in different shapes and sizes. This will add interest to the tree, even when most of the ornaments are similar in color. And, add lots of fur to add texture! 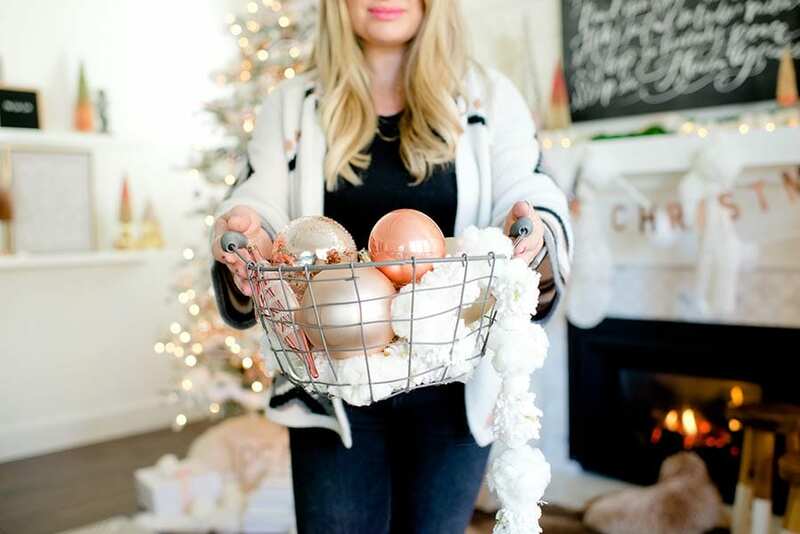 I found some faux fur decorative picks at Michael’s that added the perfect warm and fuzzy feel to my blush and copper Christmas tree! I had my friends Jodie and Janine over last week for coffee. But, the coffee was a ploy to get them to help me decorate! Ha! One of my favorite parts of joining this blogging world has been getting to meet new friends! Jodie and Janine live close by and we get together often. 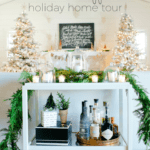 They are my blogging besties and I couldn’t have pulled off this Christmas home tour without them! When they were over last week, Jodie suggested I move my bar cart from it’s tired old spot in my dining room and put it behind my couch. See, this is the great thing about having three creative minds in one room. When you put them together wonderful things happen. 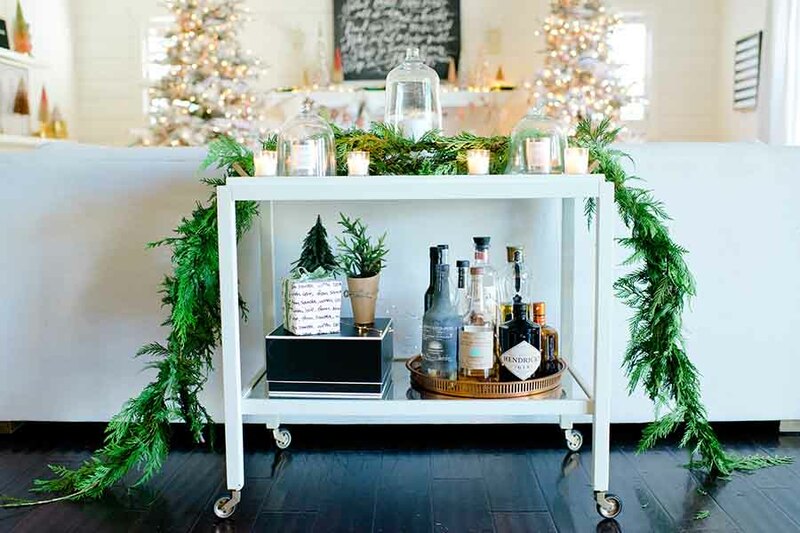 I love the new spot for my bar cart, and it makes my living room feel extra festive this time of year! And this has become my favorite view in the house! I draped my bar cart with fresh cedar garland from Trader Joe’s and topped it with my favorite Agape candles. The Balsam Branche scent is my absolute favorite this time of year! Thank you for stopping by! 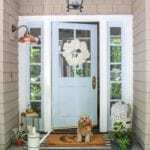 Please be sure to visit all my friends that are joining me in showing us their holiday homes. So much inspiration in store! 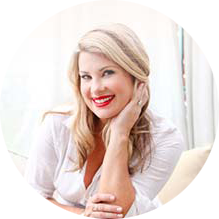 Ashley i adore your copper and blush colors!!! so gorgeous! your bar cart looks fabulous behind the sofa. I wish you and your family a very merry christmas season! absolutely stunning. 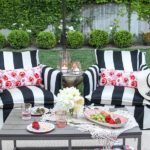 you did such a fantastic job styling your holiday home! thanks for all your help on this tour and here is to another great post! i LOVE THE BLUSH AND COPPER COMBO! 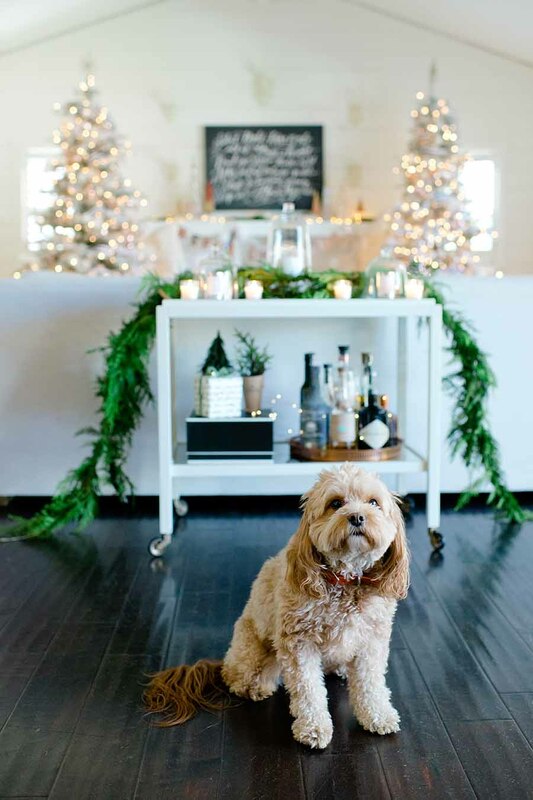 iT MAKES EVERYTHING LOOK SO WARM AND INVITING… AND YOUR BAR CART PLACED BEHIND THE COUCH WITH THE FRESH GARLAND IS ABSOLUTELY STUNNING!!! everything is so gorgeous Ashley! 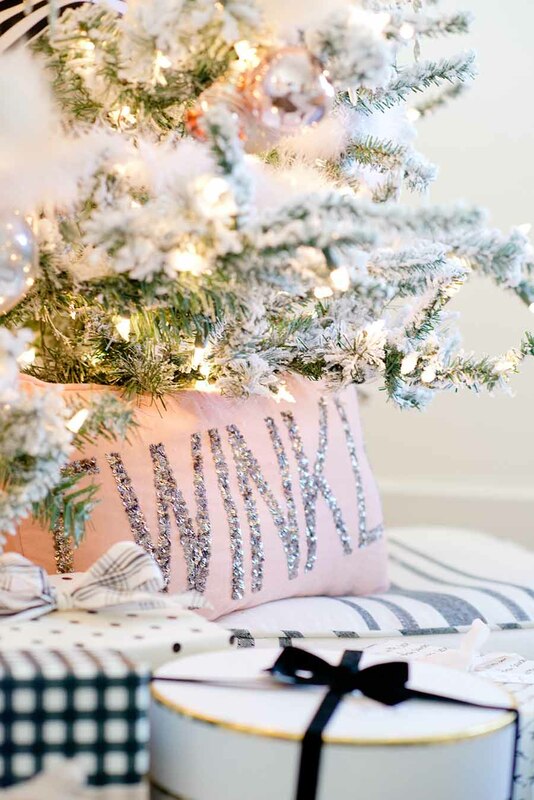 I love the black and white ribbon, and all the blush touches! Oh Ashley it’s just perfect! I love the twin trees and the colors couldn’t be prettier. So lovely! 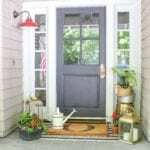 Omg your home looks just fabulous! Amazing job on this decorations.